And now a challenge - I would like you to consider frogging. Yes, Frogging. Frogging is a wonderful word that does not mean to behave like a frog, leaping and splashing about. No, it means to search for frogs, to look at frogs, to learn about frogs and ultimately to help gain information that will help preserve the little suckers. You want me to look for frogs? Frogs - those slimy, disgusting creatures? I'm afraid that you have the wrong attitude and, by the way, a terrible definition. Frogs are beautiful, colourful, charming, noisy, melodic, rhythmic, acrobatic destroyers of insect pests. They exist in a myriad of patterns and colours and their croakings, bleatings, buzzings and wailings help herald Spring and Summer and, if we're lucky, rain and if they're lucky, a mate. They are beautiful. They are amphibians - beautifully adapted to life in and out of water. And some of them have the most fascinating life stories. That is because I meant it. So Frogging is an activity where we go looking for frogs? But surely frogs are invisible. Okay but where will we look? We can start in your backyard or at a local park or wander alongside a dam or a creek. There are many, many local places where we can start to build our collection of sightings. All you need is a love of nature, an appreciation of the outdoors, curiosity and a willingness to learn. An added bonus is that any information that you can gain about the distribution and abundance [or lack of abundance] of frogs is useful to frog conservation. Okay. Where do I find out more? I'll give it a go. You're at the right place, silly - www.froggingaround.com, for tonnes of info you want to know. Additionally, you may like to join the Queensland Frog Society - it is as cheap as chips - and there you will get access to good information and, just as importantly, get to meet many people who want to contribute to the conservation of Australian animals and their habitats like you do. Written by Ken Cross and adapted by permission for froggingaround.com. 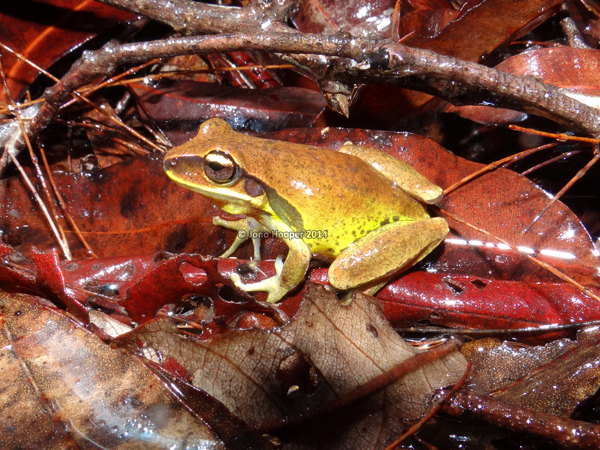 The optimum conditions to venture outdoors looking for frogs is generally after rainfall, and depending on the species, up to several nights after rainfall. Some species do not mind calling during the rain whilst others will wait until conditions are quieter and more conducive to calling activity. Some species require >70mm in a 24 hour period before they will appear and/or call. Warm, humid conditions are optimal to go out frogging, as frogs are cold-blooded and so are most active during the warmer months, generally from September to March. However, many species will wait closer to the end of breeding season to appear if rainfall events have been extremely limited leading up to such a time. Frogs can be found in many places, depending on the species. Downpipes, pot-plants, toilets, rain gauges, block work, bathrooms - virtually any small crevices can be a hiding spot for the more common species. For the lesser seen species, dry forest, wallum country and rainforest streams are home to many, of which are often threatened by the encroachment of the urban environment the more common frogs call home. Of a final note, it is important to remember that in Queensland you are not allowed to move frogs, eggs or tadpoles around. They will be much better off left in their natural surroundings. It is also recommended not to touch frogs as our skin may contain chemicals etc. that are potentially threatening to frogs' sensitive skin. Below is a list of equipment that you will generally need when frogging (although items with an * are essential and/or highly recommended).